This sleek and cozy rooftop hangout makes for a feisty happy hour. The meticulously crafted cocktail lineup and menu of small bites -- think frozen Painkillers, spicy Mexican Mules, and chicken tinga empanadas -- can be had heavily discounted. But Sunday is when things really kick off thanks to a DJ-fueled brunch (and the revamped setup offers plenty of shading from the sun). Cure your hangover with frozen vodka Gatorade while you feast on mezze platters, pulled pork egg sandwiches, and cookie butter French toast. 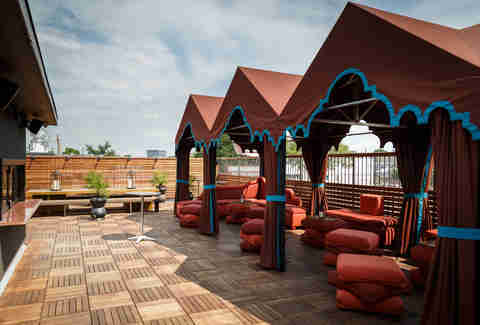 Not only does this premium party spot have a rooftop bar, but the patio wraps around the entirety of the open-air building design, meaning MAXIMUM outdoor time on a warm summer's night. To clarify: By warm summer’s night, we actually mean hot summer’s night, but that’s what the Deep Eddy sweet tea vodka on tap is for, right? 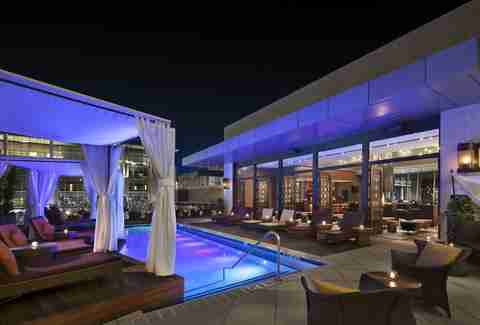 Make your way through the lounge nestled away in Hotel Sorella and you’ll be treated to an open-air oasis overlooking the CityCentre, complete with an infinity pool, draped cabanas, luxe loungers, and lanterns that set the mood. As if things couldn’t get any more alluring, the relentlessly chic space plays host to live music every Wednesday through Saturday. More importantly, nothing beats the impossibly scorching heat like a poolside poptail (that’s a popsicle cocktail, duh). Margaritas as good as the ones from this tequila temple deserve to be enjoyed al fresco, so it’s a good thing it has a 2,000 square foot balcony on which to imbibe. Take the totally rad elevator, or the winding stairs, one level up and grab an umbrella-covered table to slurp your cranberry & churro-infused marg at; and take down some Gulf shrimp tacos and old-school nachos while you’re at it. 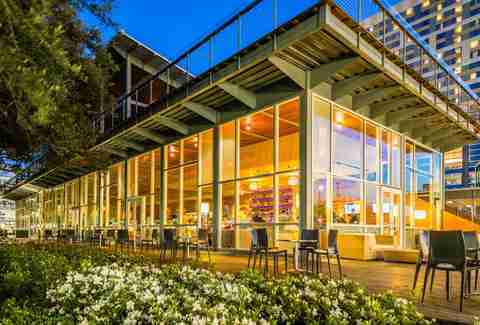 Proving that the Buffalo Bayous can, in fact, be pretty beautiful, this swanky bar with a duo of raised decks boasts picturesque views and a sublime happy hour to boot. But if you can’t make it out of work in time, fire pits, specialty cigars (by request), and Ruby Red frosé make even non-happy hours a damn good time. As do the butter-smothered roasted Gulf oysters. Overlooking the charming urban park that is Discovery Green, this two-story treehouse is one of the most beautifully designed spaces in Houston. 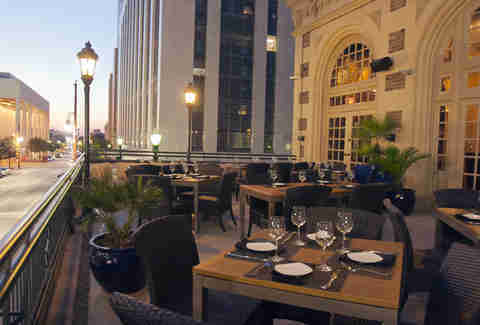 Although the second floor is a private event space, you can always lounge out on the first-level terrace to enjoy Valentina hot wings, truffle fries, and smoked redfish dip while making your way through the cocktail list. Bonus points: Herbs and produce are picked straight from the rooftop garden, which also helps to absorb heat to more efficiently cool the spot. We’re near positive you couldn’t tell by the name, but this place is a rooftop lounge. The sprawling 4,000 square foot space lures the hard partying type thanks to special events like their weekly Saturday Night Live event, when the DJ is blasting beats and the club kids are sure to be ordering bottle after bottle. 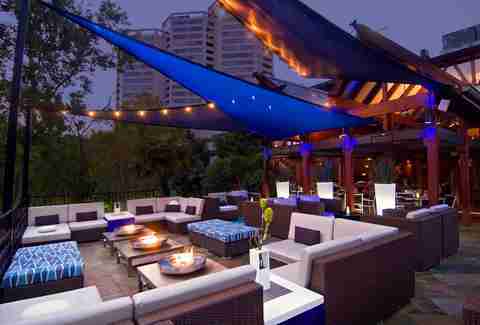 On Sundown Sundays, it’s all about hitting the cabanas with hookahs and raspberry mojitos. If this two-story watering hole looks grungy, that’s because it is. It’s managed to become a beloved hangout for both regular and industry folks thanks to rad happy hour specials, a large rooftop, and a Jekyll and Hyde-like personality that’s half serious cocktail den, half low-key dive bar. 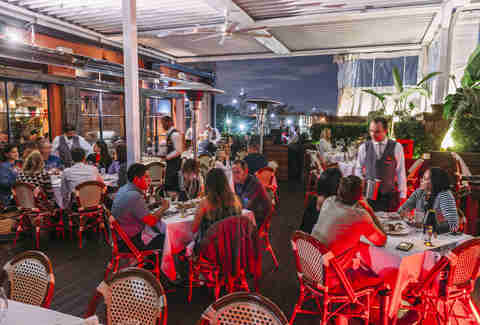 During Social Hour (weekdays 3-6pm), this bespoke butcher & steakhouse’s rooftop patio draws a well-dressed crowd looking to booze and bite. Get a view of the Downtown skyline while you take down Texas-spirited cocktails and opulent bar bites, including miniature beef wellingtons and carpetbagger pizza. And if your rooftop sesh is just a pregame for a night on the town, there’s Rare Force One, a 14-person luxury shuttle available by request. Catch a great view down on Main Street as you take down a few of spirits guru Justin Burrow’s boozed-up, old-style cocktails laced with things like elderflower and spiced wine syrup. 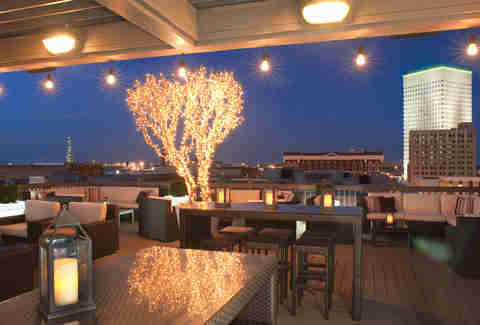 But before you get to the breezy, albeit pretty small, second-story terrace, you’ll have to find your way into the bar. We’ll help. While the drinks aren’t cheap, the four-story view from atop the historic 1839 Tremont House, which glows at night thanks to an 8 foot, lighted manzanita tree and illuminated pots, more than makes up for it. Just know that the hours are weather permitting... meaning this probably isn’t the best spot to host your hurricane party. Fact: Coastal Mexican food and freshly squeezed and infused craft cocktails are best enjoyed outdoors. So this patio bar, housed in a former ‘30s horse hospital which later became the late Montrose hotspot EJ’s, gives you two ways to do just that. 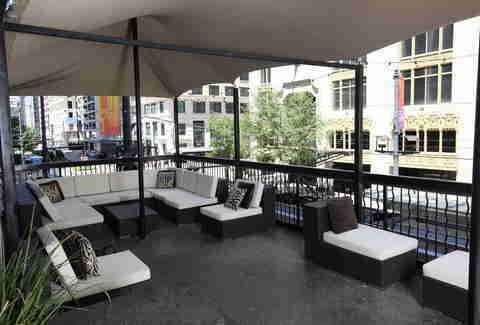 But it’s the indisputably chill terrace bar that earns it a coveted spot on this list. Gone is the storied State Bar in the Rice Lofts, a popular haunt for influential lawyers and politicians since its days as a members-only Capitol Club (which, by the way, was rumored to be where President Kennedy enjoyed his last drink). The spirit of the place remains, but the industrial space has been given a much-needed refresh, with an excellent craft cocktail & bar menu included. Sip a Bootleg Old Fashioned on the patio to watch the bustle of the city and feel the power. 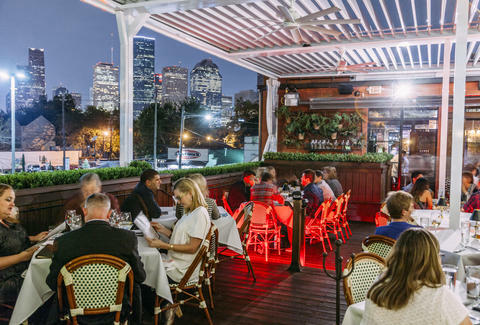 Get excellent drink specials, a generous selection of beers, and a bird’s eye view of Houston’s ever-changing landscape at this third-story watering hole. For snacking, get the Bavarian beer pretzel with apricot mustard and spicy queso. 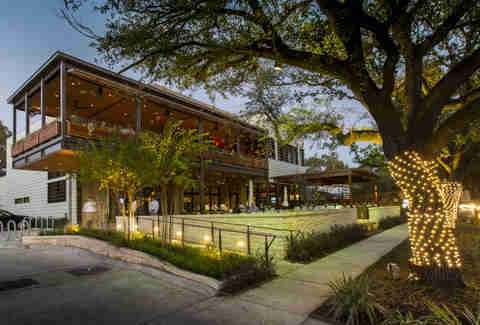 This 21-and-up reboot of Hungry’s sits on the second level of the neighborhood hangout, with a covered, open-air “treehouse” terrace that packs the house at happy hour. That’s when you can get drinks (including frozé) for just $4-$6 alongside small plates (including any pizza) for $8 and under. Fans also know to check out its daily specials, from Tuesday Steak Night to Fresh Mix Saturday, which rocks fresh-squeezed juice and booze mashups. 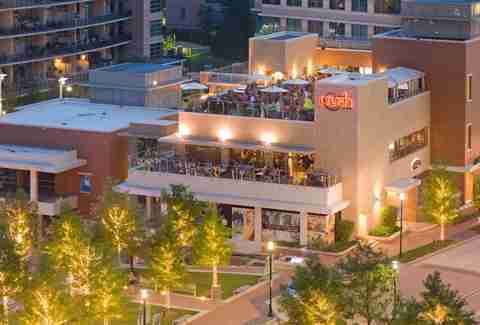 The Woodlands proves it’s got party chops thanks to this crowd-pleasing wine bar, complete with an enviable rooftop that will have you leaving the office a little earlier than usual. The bar’s Giggle Hour never fails to draw of crowd of suits looking to let loose with $5 pinots and chardonnays. Get your fill and satiate your munchies with $5 bites that’ll take you right back to college, including jalapeño poppers and Southwest egg rolls. With views of Downtown skyscrapers and a rooftop tiki hut bar, this unassuming haunt gets turnt come late night. 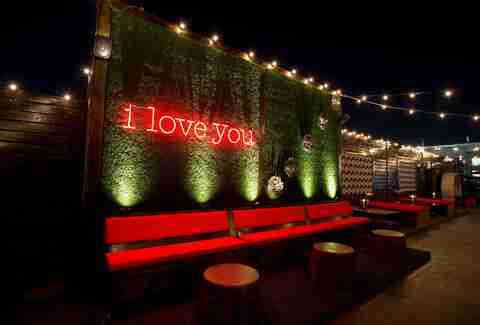 We’re sure the DJ sets have something to do with that, as do the twinkling lights, flowing drinks, and pulsing crowd. 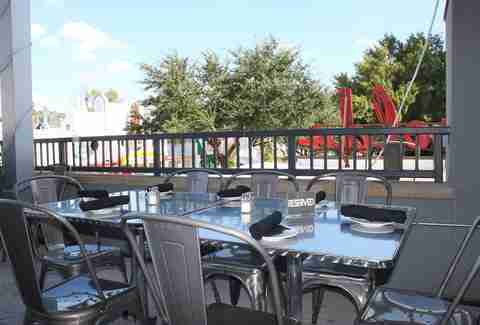 Overlooking 19th, Harold’s upstairs terrace is where you want to be on a nice day. At happy hour, all house wines are $5 by the glass, cocktails are $5-$6, and beers will run you from $2.50 to $4. And you’ll need at least a couple to wash down the kitchen’s eclectic, Southern-tinged bites. On the docket? Sloppy pork debris sliders with house-made pickles, chicken-fried seasonal veggies with cheese fondue dip, and 44 Farms beef creole-spiced meatballs. Set in a handsome, turn-of-the-century space, Springbok boasts a second level patio that overlooks Main (perfect for shenanigans-watching on the weekends). If things get a little too hot, there’s an indoor lounge on the same level, sittin’ pretty with a ping-pong table and offering a melting pot menu of South African eats. Don’t miss the house-made jerky, cured with coriander and packing nice heat, it pairs perfectly with a cold pint and some nice weather. Brooke Viggiano is a Houston-based who is pretty down with rooftop drinks because who isn’t? Find here enjoying some around town or on Twitter @BrookeViggiano.